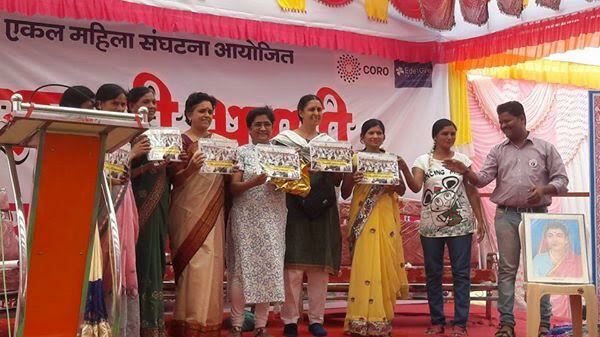 “Aapli Bharari”- The Single Women Conference was held in Ambejagoi, Marathwada on 25 & 26th March, 2017. The two day conference was facilitated by CORO and EdelGive Foundation and turned out to be a successful and inspiring event for all its stakeholders. The event opened with a rally full of energy and vigour by the women of Ekal Mahila Sanghathan on 25 March 2017. They sang praises for Dr. Babasaheb Ambedkar and Savitribai Phule for their contribution in women’s emancipation. The rally was an exceptional one as the women expressed their defiance against the social stigmas and gender stereotypes by wearing phentas instead of pallus covering their head and carrying the banner of preamble of the Constitution of India. 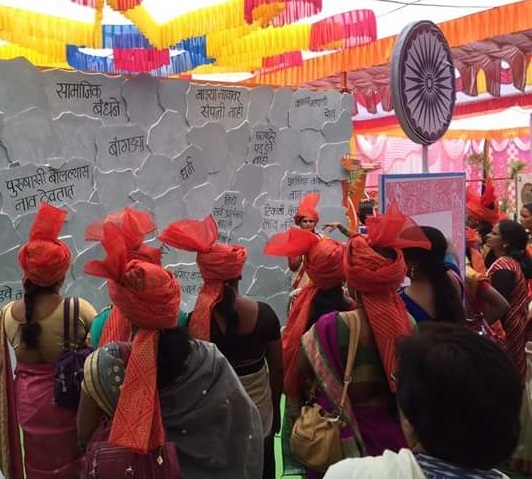 The panel discussion was inaugurated in a very creative way as the wall of social norms and stereotypes attached to single women was prepared only to be broken. The women shattered the wall in one go by a model of preamble while recognizing their constitutional entitlements as their weapon. It was a moment of glory for each single woman present there as it marked their breaking from the regressive social norms. The sessions on both the days witnessed a discussion on a wide range of topics related to issues of single women. The dignitaries spoke about various challenges that are faced by the women across various communities and castes. The prominent feature of the conference was the publication of a Research Report on Single Women issues as an output of 2 Year painstaking research done by the single women. This collectively prepared report was based on the survey conducted in 7 blocks from 3 districts of Marathwada namely Beed, Usmanabad and Latur, spanning 150 villages. The research report disclosed some interesting facts like 2% women consider themselves as MNT (Mahilene Navaralya Takale – meaning a woman has dumped her husband inflicting violence on her). The term, MNT, was coined by single women themselves. Dr. Laxmi Lingam, Professor at Tata Institute of Social Sciences, congratulated the women for completing such a tedious task without any professional help and also pointed that such a research will help them understand the politics of the issue. Both the days ended with movement songs and performances including a one-act play named “Mi Savitri Boltey” – a great saga of legendary social reformer, Savitribai Phule. There were activities and stalls put like exhibitions, gender equality awareness centre, health checkup, selfie corner etc. 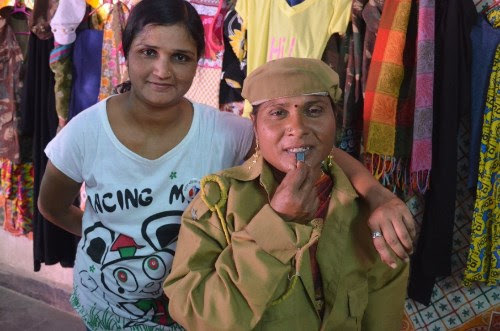 One of the highlights among these stalls was the ‘Humara Asmaan’ stall where women could dress up in various attires and role play characters such as doctors, lawyers, police officers and actors. The stall was a creative installation for women to explore the modern woman in themselves. The conference concluded with all women pledging against any kind of injustice against women in the society. They swore that neither will they inflict injustice nor bear any against women. The conference was made possible due to the relentless work by single women for two months for planning the entire event. It gave them a platform to share their issues as well as helped them explore the fantastic event manager in themselves. The two day event was indeed a celebration of women’s power and solidarity.